Messianic Judaism advocates observing parts of the Mosaic Law, including the observance of the seven Mosaic Feasts. The Restoration restored the church that Jesus built in its pristine power. It also restored the Hebraic covenants. 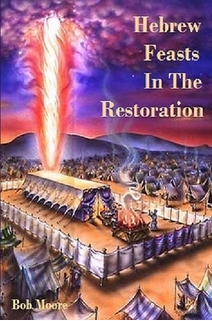 Does that mean that the Hebrew feast have place in the Restoration? Both Jeremiah and Ezekiel declared that God will one day establish a new covenant with Israel. Jeremiah wrote, "Behold, the days come, saith the Lord, that I will make a new covenant with the house of Israel, and with the house of Judah. . . this shall be the covenant that I will make with the house of Israel; After those days, saith the Lord, I will put my law in their inward parts, and write it in their hearts; and will be their God, and they shall be my people" (Jer 31:32,34). Jesus is the mediator of the new covenant (Gal 3:29, Heb 12:24), a covenant that he perfected by the offering of his own blood. The Jews not only crucified Jesus, but they rejected his gospel as taught by the apostles. They were cast off and the gospel given to the Gentiles (Rom 11:15-17). The Restoration, the return of Christ's church and God's remembrance of the covenant, introduces the opportunity for all Israel to receive the covenant's promises -- the writing of God's law in their hearts. Some people believe that the restoration of the covenant must include an observance of the Hebrew Feasts. Such a concept has no precedent in either the first organization or the Reorganization. Hebrew Feasts In The Restoration examines the role of the seven Hebrew feasts in the latter-day work and what observance, if any, Latter Day Saints should give them.